So this week, I’m going to take a look at how Web 2.0 tools are being used in education. And just to give you food for thought – I decided to start off my first posts NOT TALKING about Web 2.0 and instead TALK about using technology with students. Years ago, before I became involved in e-learning, when I was asked to take some of the aquaculture computing class it made me feel really stressed. WHY? Because these students had grown up with computers, they had used them all through school. SURELY they would leave me crying behind in their dust because they had to be absolute GENIUSES when it came to using computers compared to poor old me who still can’t to this day use a graphics calculator! What I now know is our greatest misconceptions of the so-called digital natives (people who have grown up immersed with technology) or Generation Y’s (the Internet Generation) students relate to our belief that they have a high level of digitally literate and actually want to use technology. The reality is our students are fantastic at using technology how they want to use it e.g. SMS or IM friends and are much more comfortable using it. They have no fear that the World is going to end if you press the wrong key or install the wrong program! But it DOESN’T make them they are good at using it how we NEED THEM to use it or that they want to USE IT! My fears years ago had no basis — I have not yet meet a student who is better at using technology than me and this includes students that were required to use a laptop for every class. Saying all this however if you use technology effectively with your students and demonstrate the benefit to them it definitely does engage them. I strongly recommend you listen to this interview with Becky Saunders on the use of technoloy with students. Becky facilitates instructional intelligence workshops for TAFE lecturers. In the interview she explains how we need to consider the needs and wants of our students when using any teaching strategy with students. WHY did I want to talk about students digital literacy levels? Because many lecturers that I interact with fear engaging with the use of technology with their student because of THEIR BELIEF that their students technology skill level has to be better than theirs. My advice don’t be frightened! Start by using the tools in your personal life or to manage your workload and as your skills increase you will soon see how it can be used with your students! Well I’ve jumped in boots’n’all and I don’t have a clue where it will lead me. I’m just focused on immersing myself in the technology. My students think I’m tech savvy because I’m half a step ahead in some things. No doubt they all use MySpace, SMStxt, email – but to talk with a teacher? That’s new to them. Great post Sue – this is the best I’ve heard this said. Many have been suggesting that the Gen Y and technology myth needs debunking, or at least clarifying, and you have done that beautifully. An excellent post Sue. This point has come up in staff meetings and during IT workshops, etc. Sure there are students who may know a few more keyboard shortcuts and can type much faster than I. Yet, there are a wide variety of skills lacking. They can all make an iMovie or Windows Movie Maker project but they exhibit little creativity with their editing, timelines, etc. They do not explore the technology. They produce a video then what next? Teachers then have to share the technological possibilities that are available to allow online publication or dissemination of the product. Even use of tools like Word or Powerpoint is quite basic on the whole. Rarely does a students show an eye for good design or layout. These skills need to be taught by the teacher. I am trying to encourage the student population at our school to avoid wasting endless hours with MSN Chat, MySpace and the like and steer their energies towards the construction of blogs and web sites that are beneficial for themselves and the wider community. It is an uphill battle. Perhaps they are not Digital Natives at all but Digital Dilettantes… they are, and I quote from a dictionary, an amateur or dabbler; especially, one who follows an art or a branch of knowledge sporadically, superficially, or for amusement only. Pingback: Mobile Technology in TAFE » Blog Archive » This Is CRAP!!! Good one Sue. My advice re the last point, ie “fear engaging with the use of technology with their student because of THEIR BELIEF that their students technology skill level has to be better than theirs.” is to plan how the technologies can best be used WITH the students and allow the students to take the lead and teach the teachers how to use the technologies – reverse mentoring. Imagine Sue, if you were doing a course with me as the teacher and I dictated to you how we were going to use mobile technologies to learn. It would be frustrating for you – your knowledge of mobile technologies for learning is much greater than mine. I would be much wiser to recognise the knowledge you, and possibility other students, have and plan with you how to do it best. 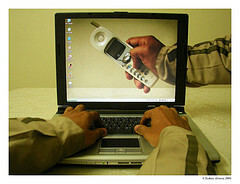 Pingback: Mobile Technology in TAFE » Blog Archive » Reasons Why IT May Be Crap! I think that is the best aspect about what you are doing with your students is that they are talking to you and you are getting a better understanding of who they are as individuals. Regarding feeling you way along –I do it all the time. I have just set up some work with them on a wiki and told them that we are learning as we go, for great things to happen we have to understand that things may not go as we expect. It means a lot when an experienced practitioner like yourself says that I covered the topic well. Thanks for taking the time to tell us about your experience with the digital natives and to follow up with a post on your blog. I suppose what is happening is students are using a range of applications during their education and we all keep assuming that they are learning to use them well. Interestingly there is a program in USA where students run professional development workshops for teachers to learn technology skills. I would love to some of the students that are really into technology work with educators so they could all gain from the interaction. Pingback: Mobile Technology in TAFE » Blog Archive » I’m Feeling Like Crap! Please Help Me Out!! !